Homemade easy vermicelli kheer recipe is a famous Indian recipes. It is very simple and easy to make with less time. Here are the methods to make this delicious recipes. 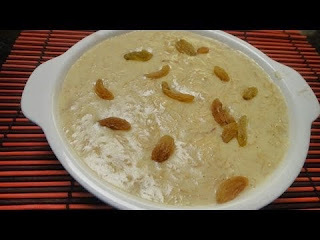 To prepare homemade easy vermicelli kheer, take a pan add ghee, heat it up. Now, add a vermicelli in it and fry it till it become golden brown color. Put it into bowl and keep it aside. Pour water in the same pan till come boiling point, add fried vermicelli in it. Cook it til the vermicelli become soft or boiled. Now, add sugar and green cardamom (crushed) and milk. Garnish with cashew or almonds or kishmish. In this method we did not used milk. We make a simple vermicelli (seviyan) which is also called vermicelli with water. The method is almost same as we prepared a vermicelli (seviyan) using milk. If you want to make vermicelli but you don’t have a milk then you can prepared a vermicelli with water. Here a method to prepare vermicelli by using water. To prepare home made easy vermicelli (seviyan), take a pan add 2 tablespoon ghee, heat ghee. Now add vermicelli (seviyan) in it and fry it till become golden brown color. 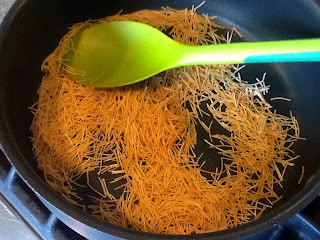 Put these vermicelli (seviyan) into a bowl and keep it aside. Now, pour water in the same pan till coming boiling point, add fried vermicelli (seviyan) in it. Cook it till the vermicelli become soft or boiled. Now, add sugar and green cardamom (crushed). Cook for 2-3 minutes or till the sugar mix properly.